The second reading (from Ephesians) haunts me this week. How wise the author of this letter is, and how desperately we still need those words today. It’s hard to imagine how different the world used to be. St. Patrick heard confessions from Christians in Ireland who rejoiced that they had murdered fewer people that year than they had the year before! Saint Ignatius Loyola, after his conversion (! ), set off to murder a man whom he fancied had insulted the Virgin Mary. Grace and the Holy Spirit compelled him to take a different turn in the road, and that has made all the difference. Believe it or not, the world is actually a safer place now than ever in history. But what is the state of our souls? Ephesians begs the earliest Christians to remove all anger and fury…reviling and malice from their hearts. Ah. So that’s where we can find common ground with those ancient believers, whose lives were in far more peril than ours but whose hearts bore the same burdens of rage and desires for revenge. I wonder why these new Ephesian converts struggled with each other. Was it bad blood between families? Or, God forbid, were they fighting about religion? The Sikh community in Wisconsin now has to bear the terrible loss of their loved ones because one man let his racism and his ignorance of religion take over his soul. Forgive each other as Christ has forgiven you. St. Paul knew that was the only way out of the sad webs of enmity we weave throughout our lives. It is the only truth that saves, then and now. Are you having trouble forgiving someone? Try to remember when someone forgave you. That’s where God shows up, guaranteed. Is there an area of your live where you need to learn tolerance? This reading hits me where it hurts. Because I belong to a different political party then some of my family and friends, there are times when I get angry at things they say and have to grit mt teeth to keep quiet. 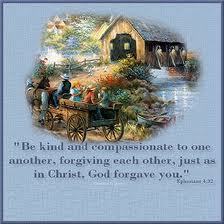 i try to remember this is just small stuff and not to hold grudges because we are different. I love them and try to remember to be patient. There are many areas of my life where I need more patience and tolerance, but the hardest area is in my relationship with my husband, who is an agnostic. I have had to learn to accept him where he is and just love him. He loves and accepts me and supports me in whatever I want to do, and he really is a good person….he’s just not a believer. It’s a tough road to walk, but God is helping me along. And here’s the funny thing….living with and loving him has forced me to face my own doubts and confusions,and truly understand why I believe what I believe. I believe my faith is much stronger because of that. By the way, I love this site!!!! Thank you!!! !